When I came home from Blythe Carnival Singapore last November, I couldn’t stop talking about one particular aspect of the whole experience- the sewing classes. I had been to BlytheCon Japan the year before but I missed out on some of the sewing classes, so for Blythe Carnival Singapore, I made sure to be there for almost all of them. Admittedly, I am a novice when it comes to sewing, and I can pinpoint the particular moment (throwback: Sewing Frenzy) when I developed a fear of it. Faced with my idols, the sewing geniuses behind Momolita and MisukeToybox, however, I braved abject humiliation and signed up for the short classes under them. I did buy a few souvenir items at the Blythe Carnival, but mindful of wanton splurging, I made sure to keep within my budget. And yet, even as I calculated and re-calculated my purchases, there was one thing I really wanted to bring home (short of owning a custom from Umami Baby or PJdoll, which, at this point in time, is still a big dream, cross my fingers🤞)- the Juki TL2010Q. This was the machine they let us use for the convention workshops. It purred like a kitten under my hand, didn’t bite my fingers off, and was just about as idiot-proof for a “second-rate, trying hard” crafter like me could be. Alas! For about SGD1100, it was more than my budget could allow; moreover, I could not bring it home without paying additional baggage fees. I must have kept talking about the Juki for a while after I got back, until I found something else to obsess upon (yes, still obsessing about a dream custom) and all talk of the Juki petered out into wistful nostalgia. I learned to re-love my old Singer, (I now call her Jenny Lind, for the late singer in “The Greatest Showman”), never mind that she clangs a whole lot when she bites upon cloth and jars the whole table when starting and stopping. And when she did finally stop working, I resolved to find a repairman for her and not ditch her for a new model. Today, I am already plotting the hours for when I get to spend some quality time with my Juki. I have ideas brewing at the back of my head, designs for doll fashions I hope I can conjure into reality. Heck, even if I fail, at least I don’t have to manually sew Alphonse’s shirts again. The Juki will see to that. I am going on a trip with some friends for a weekend next month. I’ve made a list of things to bring for that weekend, light clothing, comfortable shoes, camera- all of the usual stuff- BUT since this will be a weekend with other doll collectors like me, I figured a doll (or two) was in order. Since I’ve met Nimes (Blythe Slow Nimes), I’ve never been without her for long. I take her almost everywhere, even to the most unexpected places, because she’s always such a pretty addition to the places I go to. Despite being reminded now and then that I do have other dolls to play with, I’ve decided Nimes will be my companion on my weekend trip next month. 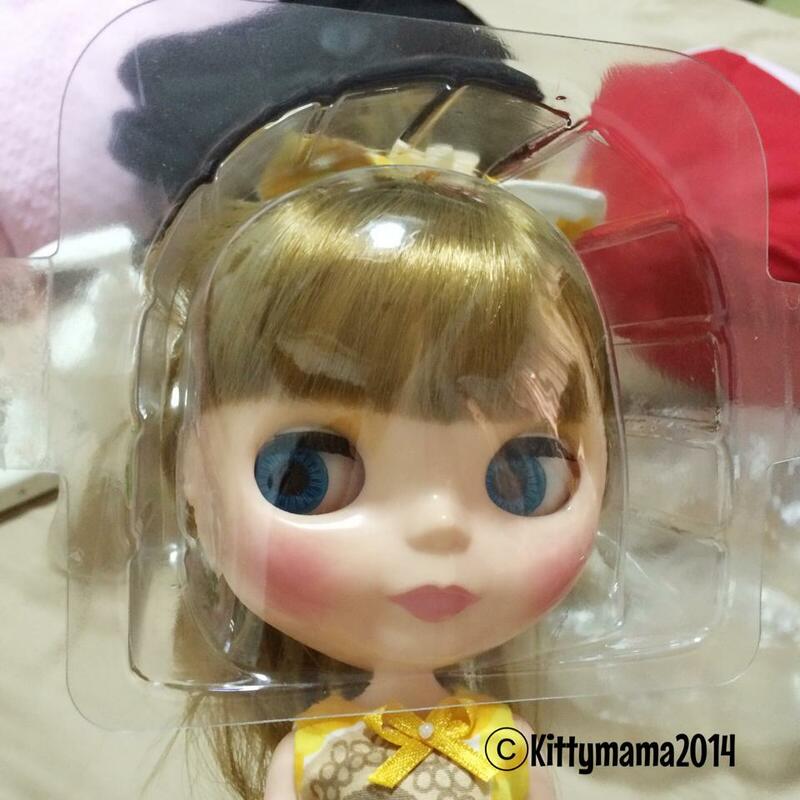 There are, however, certain challenges to bringing a Blythe doll everywhere. 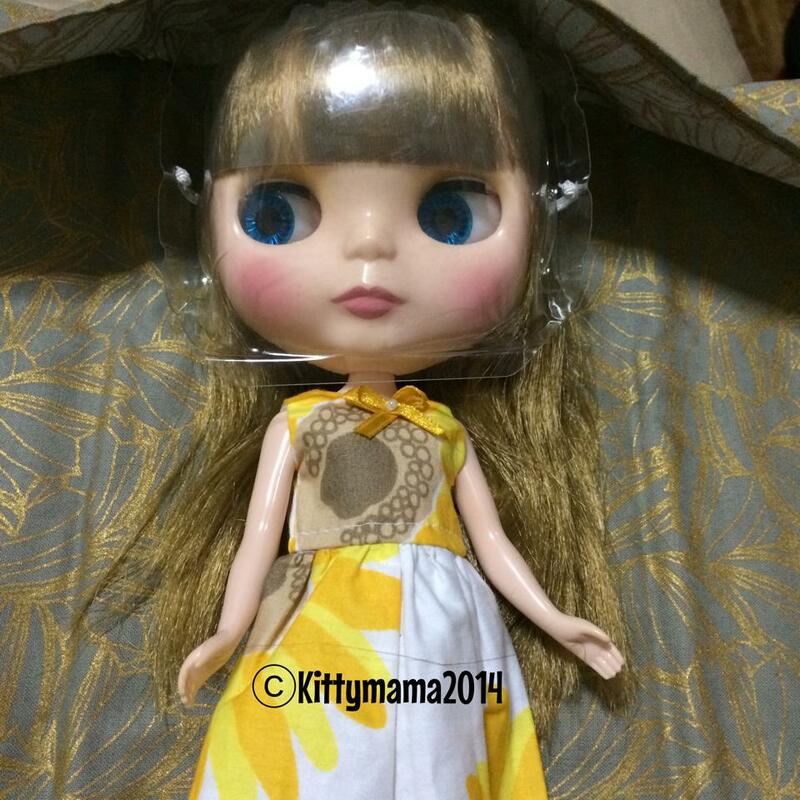 When I travel within the city, I carry her in a clear plastic box or a small doll carrier. But this planned weekend is starting out with minimal luggage so that means not only do I have to be spare in my essentials, I will also have to squish my doll in with the rest of my things. This poses some problems with dirt and staining; her hands and feet have gotten dirty at times because of this. It’s a good thing a little washing did the trick but I’ve since learned to always wrap her in a white bird’s eyeweave diaper to prevent direct contact with things that can discolor or stain her. Beyond this, there is also a problem of accidentally ruining her eyelashes or her face. Sometimes, when she is squeezed tight with other things, her face could get scratched or her eyelashes inadvertently folded. 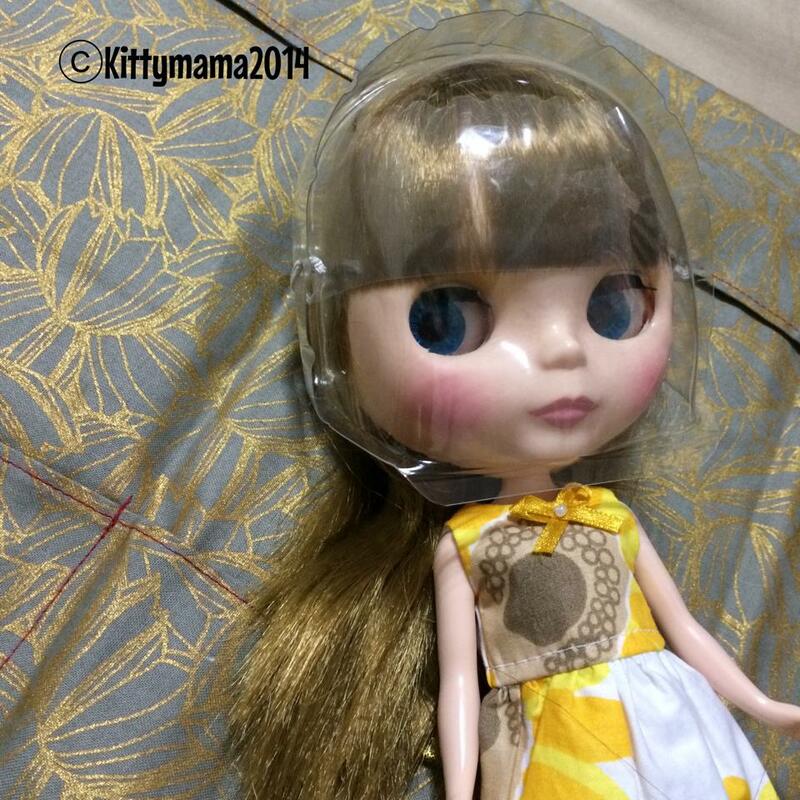 As such, face guards are a necessary addition to a traveler’s doll requirements. 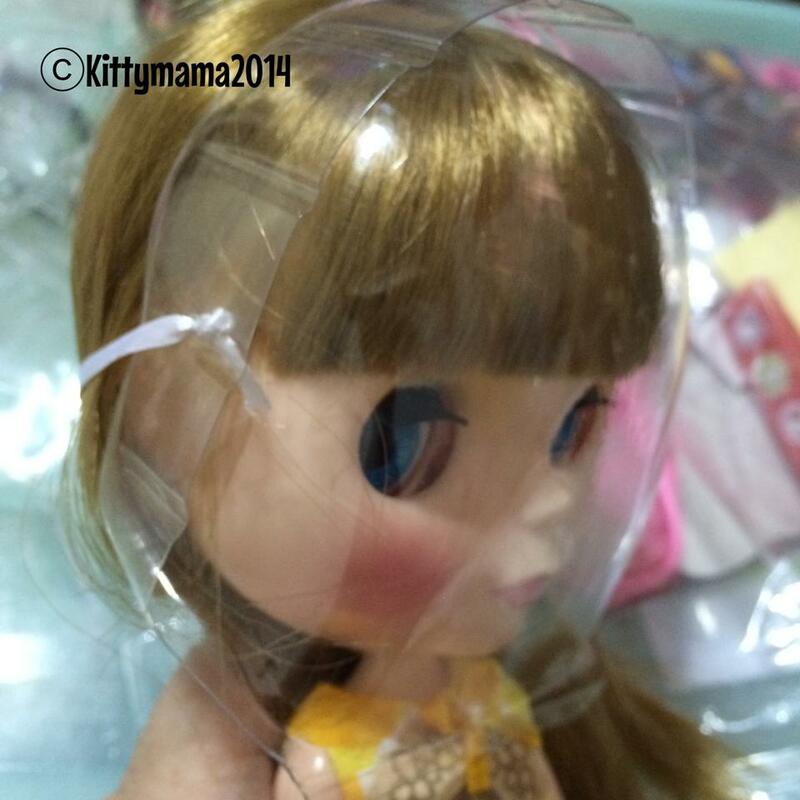 I’ve only seen one type of face guards sold online and that is Cool Cat’s Face Guard for different dolls. 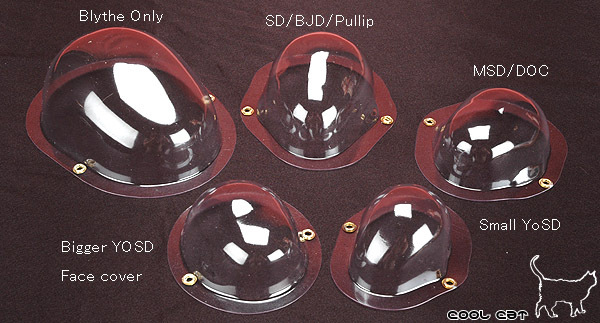 They are very affordable (less that USD2 a piece) and well worth the money you will spend on protecting your Blythe’s face. 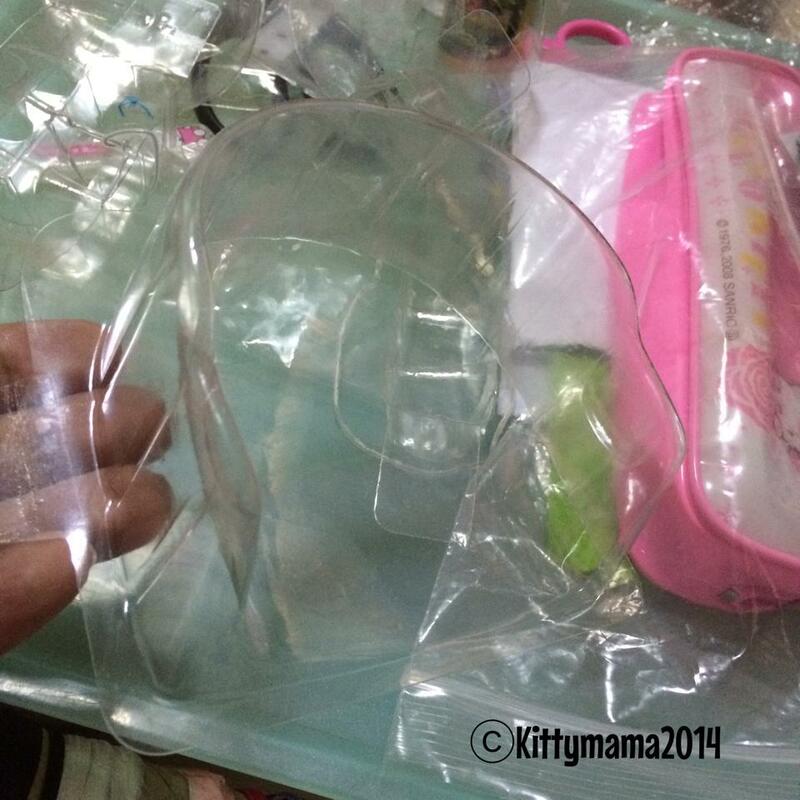 Each face guard is made of molded plastic and comes with an optional foam to put around the face. Rivets hold the elastic band in place. Very nice, right? I’ve made a note to ask A♥ to get me some, but in the meantime, while I wait (and the real gist of this story was that I couldn’t wait, haha!) I was seized with the idea to make one. A DIY Lightbulb moment- ta-dah! 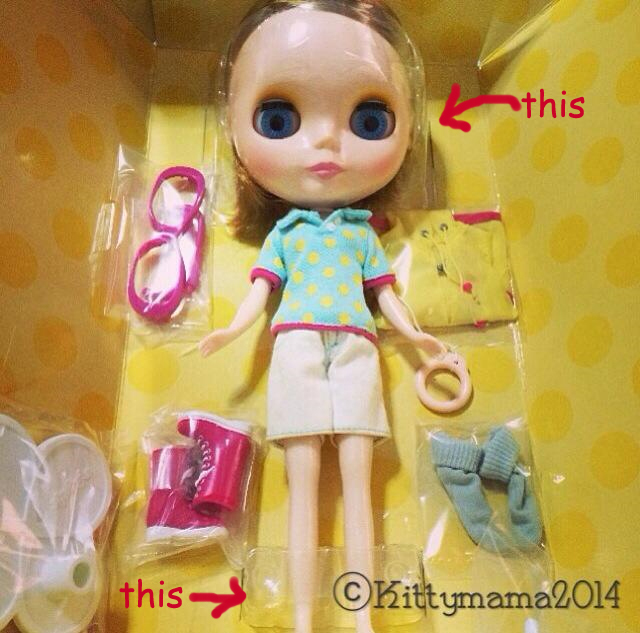 You know those plastic bits that come with your Blythe dolls, the ones designed to cradle the head or hold the feet? I’ve kept all of those in a separate box when I flattened the original boxes and carrier cardboard. I didn’t think I’d ever find a use for all of them but I was just hesitant to part with them all. But this afternoon, while looking around the house for an item that could serve as a potential faceguard, I suddenly thought of them. 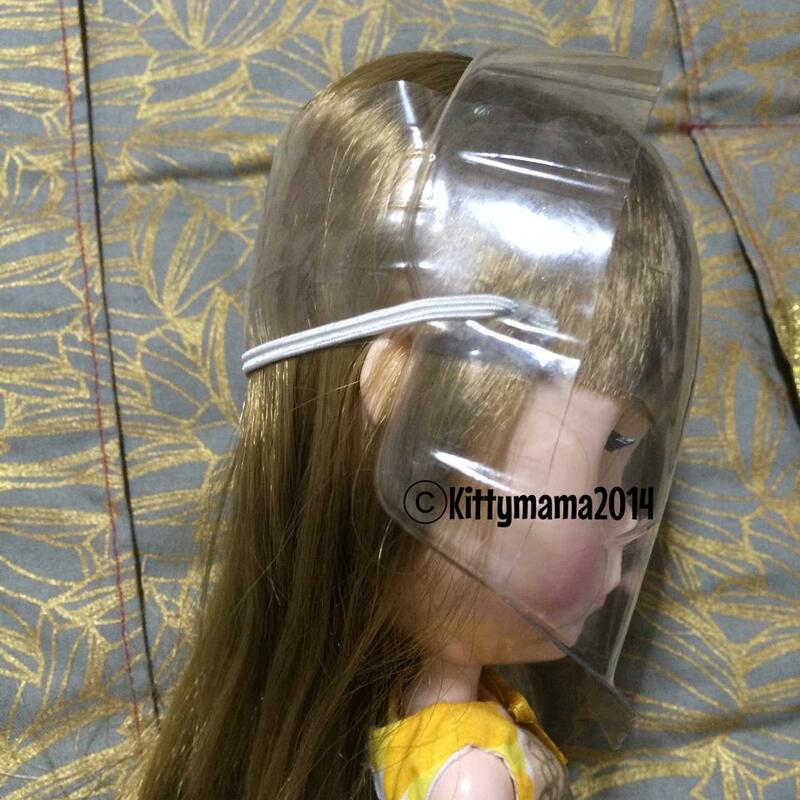 A quick inspection showed that this particular piece of plastic- the head cradle- works well when turned over and placed over the doll’s face. There were no points of direct contact to the cheeks, forehead, or eyelashes, and the smooth plastic was not likely scuff up the doll. I cut around the edges to reduce volume, making sure to cut in rounded corners to prevent pointy edges that can scratch. And then I manually bore two holes, one on each side, to thread ribbons or elastics to hold the face guard in place. And what do you know- it works perfectly! I tried using a ribbon first and while it was nice to look at, the ribbon also had more “give” and was looser than a thin elastic band. Changing it into an elastic, or a garter, as we call it here in the country, made the fit better. Instead of knotting the elastic, I sewed the edges shut to prevent it from slipping through the holes in the side. 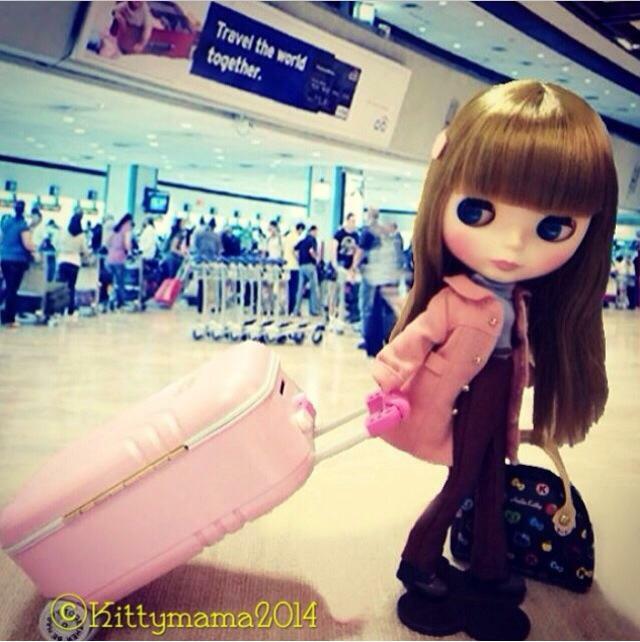 Now, she is ready to travel! 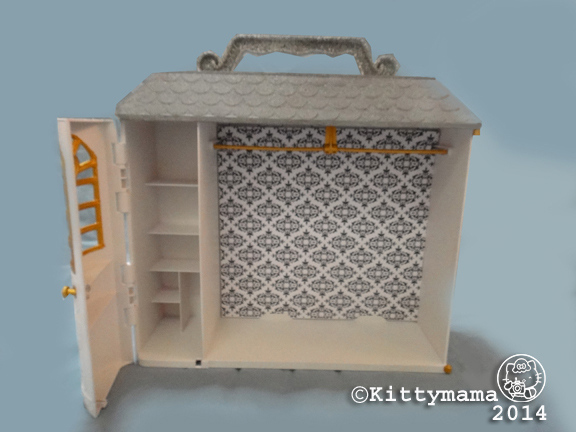 I’ve been meaning to ease myself back into repainting some of my old doll houses, but I wasn’t really sure I could commit to such a lengthy process right away. I’ve had the materials on hand for a while now, but I couldn’t get myself to jump in on a project. That is, until a perfect “practice” project came along. 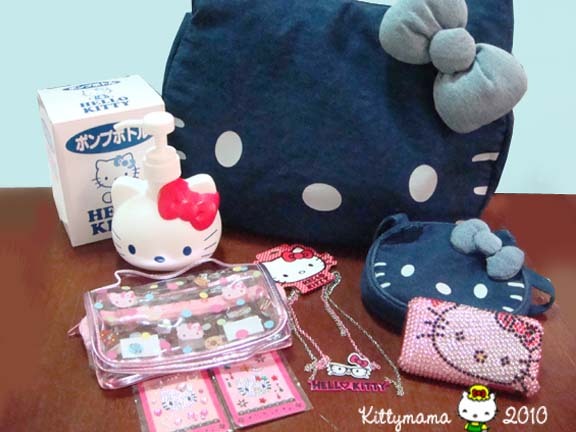 Very cute, right? 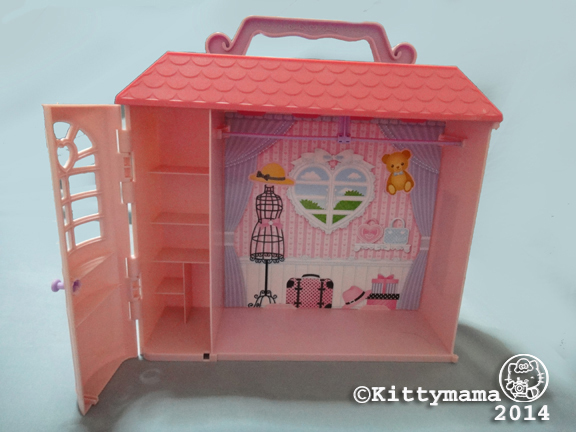 I think it’s a very nice playset, functional too, as the shoe closet also serves as a carry case for a Licca doll when traveling. 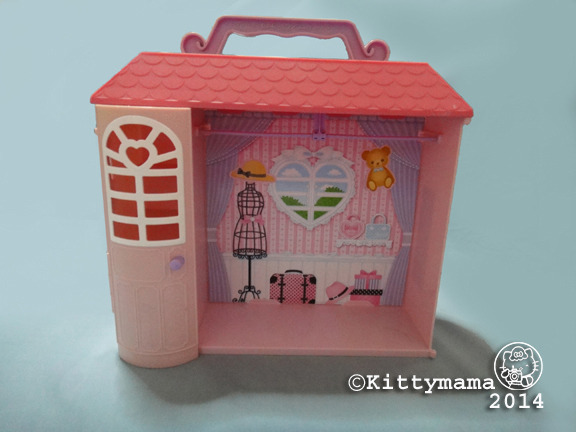 This Licca dressing room was missing the hinged flap that serves as a cover to the room. As you can see, there are two exposed hinges on the side where the plastic hinge of the cover should be. The good news was that the door was in great condition, save for some dings on the sides and small scratches on the design in front. The back and sides also just had minor discoloration strewn here and there in small, irregular patches of yellow. It took me just ten hours to finish this project, spread over two days and with long drying times in between. I actually spent more time waiting for the paint to dry completely, so I did chores at home or worked with Alphonse while I waited. The plan was to make it less childish in appearance by changing the color palette to one more suited for an adult doll collector. 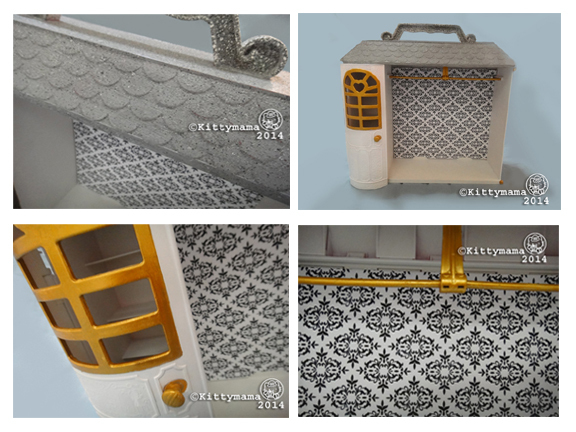 Choosing white and gray as its base colors and gold as an accent made this project elegant and less plasticky in appearance. I used a stone acrylic paint spray for the roof to add texture to the gray primer and base pant. The white I used was a mixture of flat white primer and pearly white acrylic spray. A bright gold was painted on selected parts to serve as accent color. I also covered the cardboard backing with a printed sticker (printed on matte sticker paper and sealed with a clear sealant to prevent smudging or running) and kept the black and white theme on it to make it less fussy. I sealed the whole thing with more clear spray and waited overnight for the seal to dry. 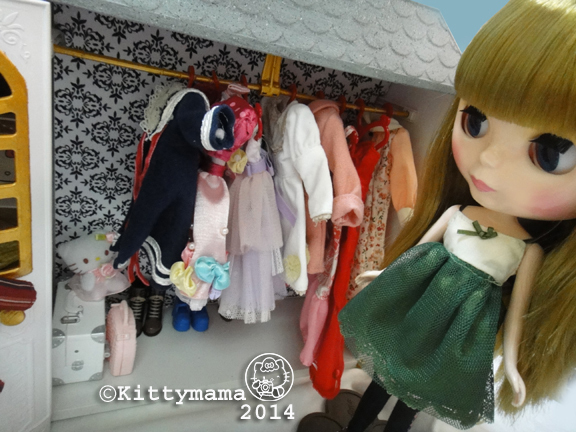 Just this morning, I tried it on for a few pictures with my dolls, just to see how it would look with them. Success! 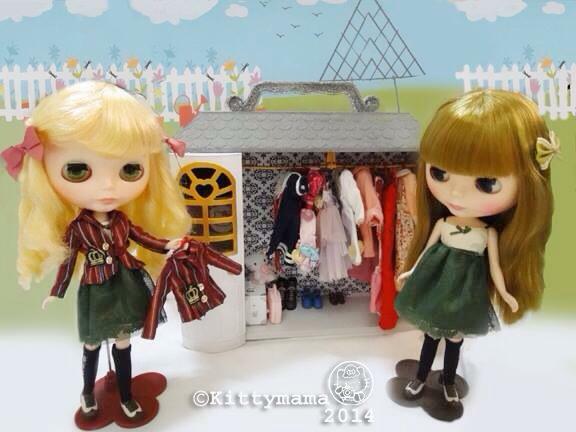 I like that I now have an extra closet for Blythe doll clothes. I will keep looking for that missing hinged part or perhaps replace it in the future with a home made cover. Another option would be to hang sheer white curtains in front (with tiebacks) to keep the clothes covered when not in use. In any event, this modded set will certainly get a lot of use as Nimes, Sitti, and their Blythe sisters play dress-up. 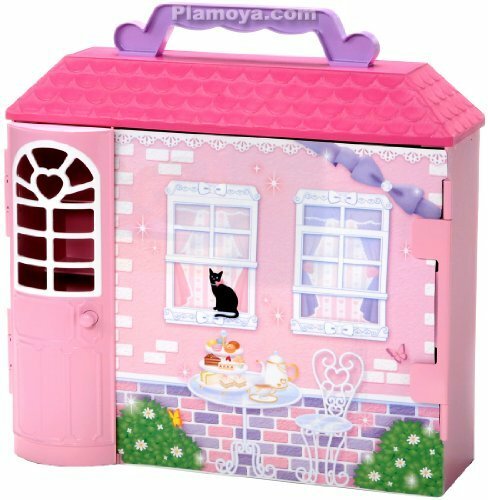 Am I ready to remake a Sylvanian building now? You bet I am ! On to the next project! Pika- Pika- Pick a Chu! 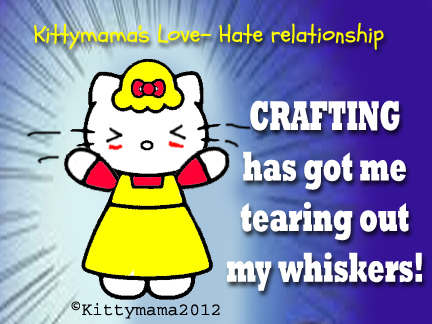 It’s no secret that I am a trying hard, desperate crafter-wannabe and that hasn’t changed at all in all these years. I think the desire to create, to embellish, and to bling has gotten even worse as my mind conjures more DIY possibilities for the things around me. 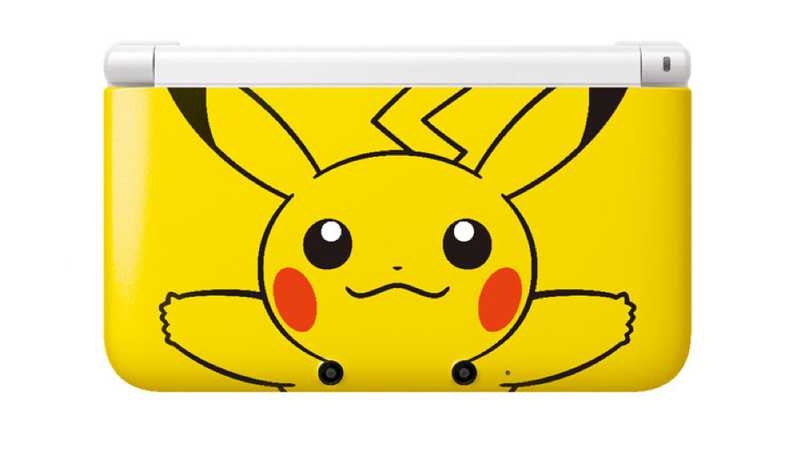 Take the case of my beloved Pikachu 3DS xl. It’s lovely as it is and terribly cute. And since this limited edition sold out on its release early this year, you’d see its price already horribly inflated in the market. As such. the thought of “skinning” it gives me the heebie jeebies (okay, worse than that, actually). No one in his/her right mind would dare tamper with the original design for fear of ruining its value. And yet, my itchy fingers are nagging at me to do something. Something to personalize it and yet won’t be irreversible in nature. 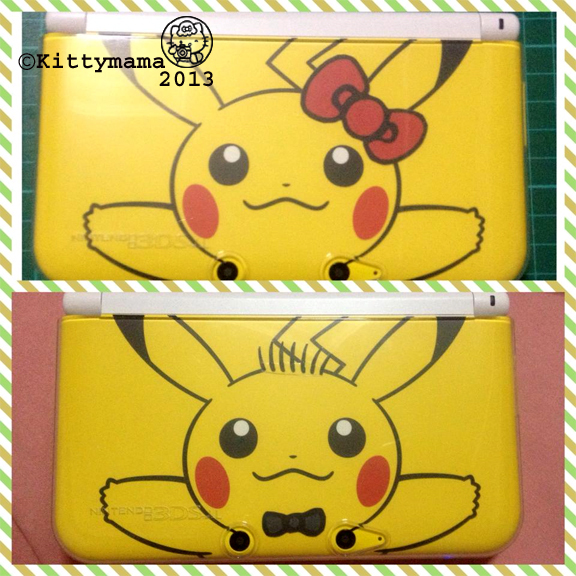 Meet Hello Pikachu and Dear Pikachu, Pikachu’s take on Sanrio’s most famous couple, Kitty and Daniel. Of course, once you start on this path of craziness, it’s bound to get worse. 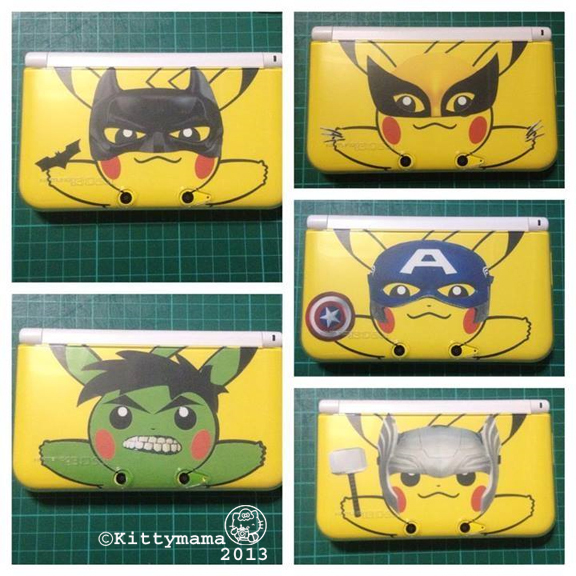 *cackles maniacally* Some days, Pikachu just has an identity crisis on his hands, never knowing which superhero he wants to really be. And then there’s this, an homage to one of my favorite modern literary characters (I made this for my friend Laser), here’s a truly confounding sight. Confundo! 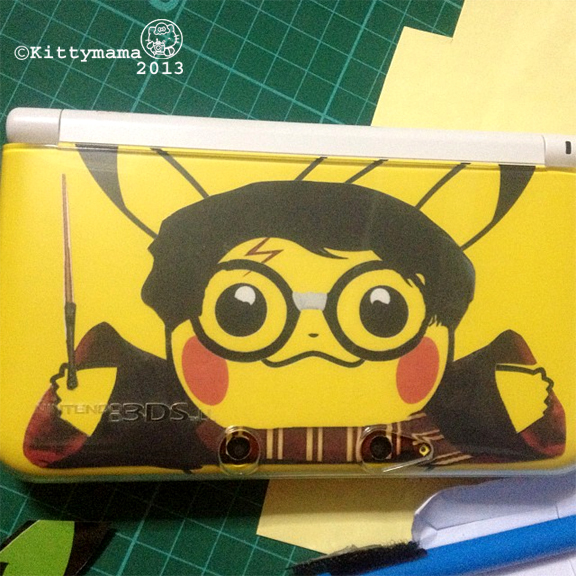 Is this Harrychu or Pikatter? Now, should I being doing “Chu Chang” next? Arts and Crafts, however, were a whole new world altogether! You have to gauge the tension of your crocheting so the chains don’t wind up too small and too tight or too loose and too large. Knitting was an awful way to poke my eyes and rushing to the ER for a consult was an even more humiliating experience. (Lucky for me, I just scraped my corneas.) Embroidery was another one of my failings: I could never achieve the kind of satin stitches my mother could make. Mine always looked ragged, sparse, and bald. Boohoo. Somewhere along the way, however, I discovered a craft that appealed to my less nimble fingers. It was no less tedious or creative or beautiful, but it was easy enough to start with for someone like me. 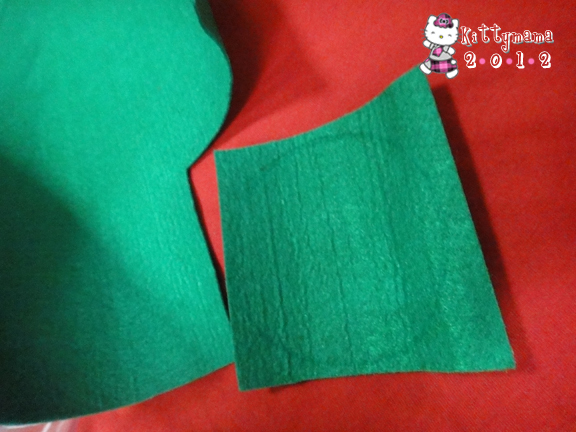 It also felt more predictable to me (more so than other stitching crafts which relied a lot on gut feel and instinct) and to make things easier, I could use a cloth with holes! Hallelujah! And so I discovered cross stitch, in the last few months of senior year in high school. This was my very first pattern. I bought it for PhP7.00 at SM North in 1985. My first attempt, although awful looking and raggedy by serious standards, was still a considerable feat on my part, clumsy fingers and all. I gave it away as a gift to a friend, who did my self-esteem a favor by graciously displaying it in her new baby’s room. I have kept this pattern with me since then, and when I look at it, I remember my first project with great pride and joy. Over the years, I have kept at this more than any other craft I dabbled on. Eventually, I did learn the basics of many crafts but nothing ever really caught on like cross stitching for me. I remember cross stitching my way through Psych rotation during clerkship in medical school. I always had a small project with me in my bag, for the very rare times when there were no emergencies of any kind on a duty night. 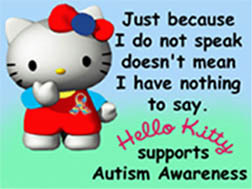 When Alphonse was diagnosed with autism, it was cross stitching that helped saved my sanity. Imagine the long hours waiting for therapies to finish and you can imagine how I lived many years in waiting rooms of different schools and therapy centers. Books helped, of course, as also the Gameboy (this was before the era of other handheld gaming consoles) but nothing eased those long hours like the repetitive motions of stitching. I stopped stitching in 2009, after the trouble with my neck started. I couldn’t stand bending my neck for hours then. My arms and hands felt thick and even clumsier than usual. I packed away all my stitching books and supplies, a little sorrowful at the end of such a long relationship. I kept thinking, “What if I tried my hand on those pillows? Can I do it?” I wasn’t even convinced I could do it again, not after almost three years of a stitchless existence. But then, as it often happens to me, the universe sends me the answer another way. On the same day I found Pornphan’s picture, I discovered one of my friends (Hi, Sandee!) was into cross stitching too when she posted a picture of her weekend project. One comment led to another and soon after, she invited me into a Facebook group of Filipino cross stitchers (Hi, Margaret! Hi, Mamila! Hi, Michelle!). So now I am rediscovering my old love for cross stitching. 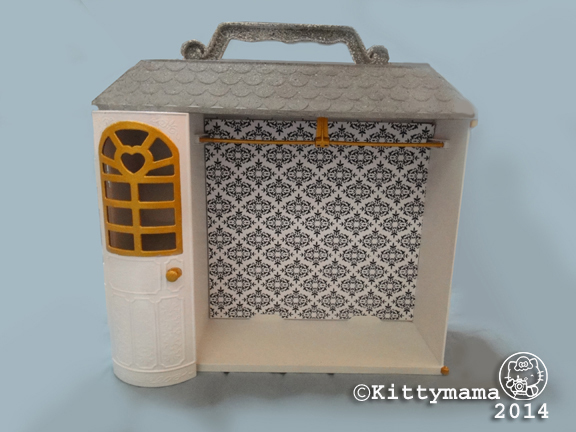 In the frenzy of finding a new community with a similar passion, I went to straight to work and unearthed my old floss box, my dowels and stands, my old patterns, books, and magazines. 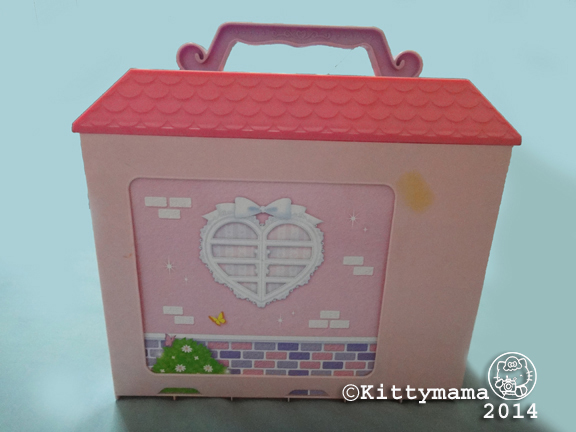 After that, I organized a new box for my supplies, pink and Kittified, of course. And then I went back to digging some more. Inside the storage box of supplies, I also found some finished, but unframed, projects. Who knew I could stitch? They bring back so many memories- and they all make me smile, of course. I love the Hummel patterns and I collected quite a lot of the patterns in booklets. My father-in-law (who is based in New York) never forgot to send me one or two when he spotted them. I love Japanese ladies and I like stitching patterns that go well with my house’s Oriental interiors. These Chinese vases deserve a spot on my wall! In the process of reconnecting with my stitching past, I also discovered a couple of WIP (Works-in-progress) that have shamefully lain dormant for years (they smell funky too, boohoo!). No excuses, there, I’m afraid. 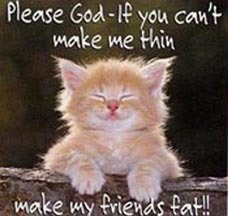 Bad Kittymama! Cross (Stitch) My Heart! I made this! A project for my mother which, to this day, hangs in her room. 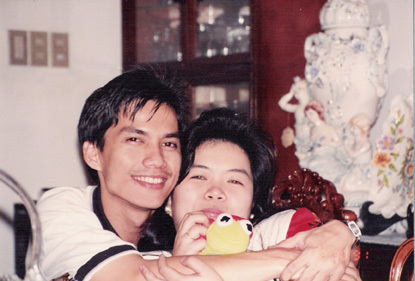 Last week, I thought of a gift to make for A♥ just in time for Mothers’ Day last Sunday. You see, on Mothers’ Day every year, as well as on all other special occasions of our lives including his birthday, A♥ never fails to give me presents. In more than 20 years of marriage, I have always been on the receiving end of his thoughtfulness and generosity. I’ve never been able to quite measure up when it comes to giftgiving or reciprocate in a manner equal to or more than he has ever shown me his love, but he has never complained. Not once. So last week, inspired by a burst of creativity, I thought of a project to give to him on Mothers’ Day. I wanted him to have a gift that reminded him of me always- his crazy, spoiled, always-loved wife. And it had to be something I could make, not bought. Guess what I did? I made… Okay, okay, okay, I am getting ahead of myself. Forgive me if I’m too excited for my own good. I guess I better start from the beginning. 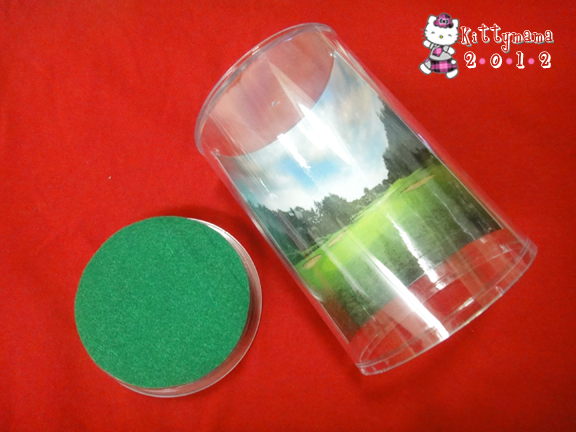 I printed two copies of a golf course background, measured according to the size of my container. 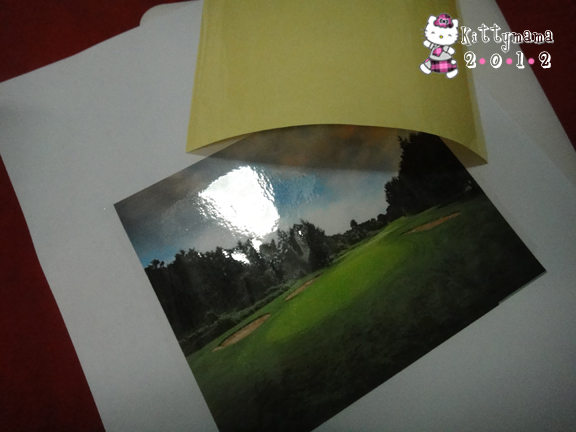 I laminated the background using self-adhesive laminating film, setting the two pictures back to back with a glue stick. I cut the pictures to the size required by my container. 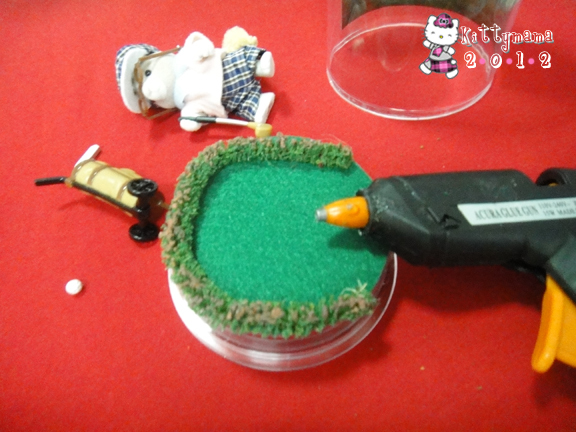 Using the bottom of the container, I traced the base and cut a round piece of felt to use as my golf course grass. 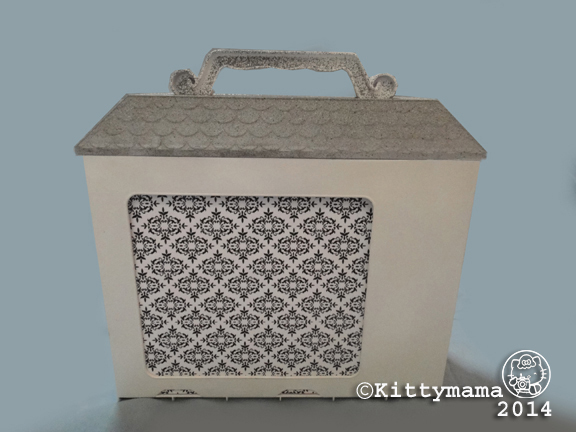 I attached the felt base to the removable bottom of the container. I also attached the background to the cylinder top. To add interest, I added foliage using a glue gun. Then, I set the figure and selected accessories. I cut a piece of green felt to wrap around the base of the diorama. This is what it looked like before I covered it. And this is what the finished project looked like. 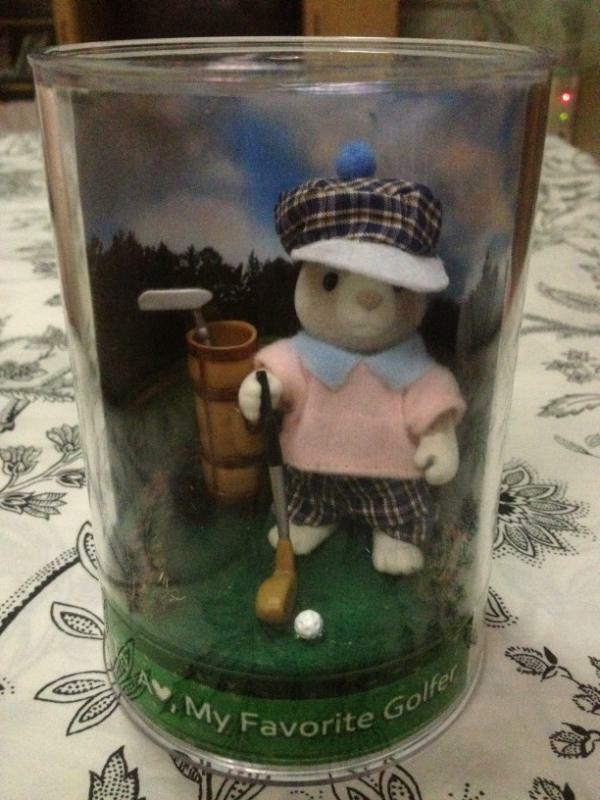 To personalize it, I added a dedication (To A♥, My Favorite Golfer) using inkjet-friendly acetate and sealed the diorama shut. Easy peasy! 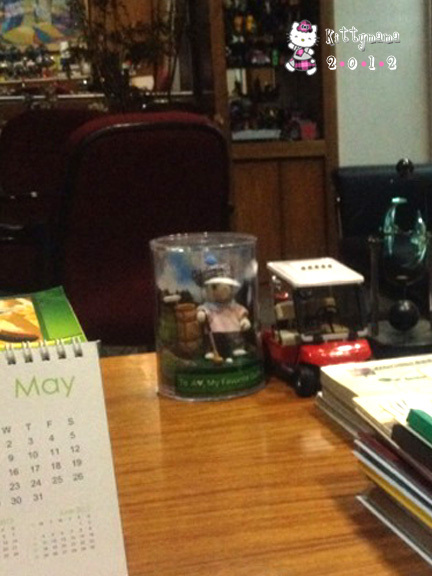 I gave the diorama to A♥ and he has brought it yesterday to his office for display. My gift may seem trivial compared to all he has ever given me, but I know he knows it comes with a lot of love and heart. I ♥ you always, A♥! I hope you really like it. 🙂 And I hope you all did too! Happy Wednesday! I got a lot done yesterday (yay!) even if one of the nannies was down with the flu (I hope it really is just the flu). After the kitchen chores and the daily bedroom clean-up, I found time to do some long overdue projects when Alphonse decided to stay outside and play during the day. I could never do any of them while Alphonse was around; he’s a very curious fellow and turns my things upside down when he gets interested. 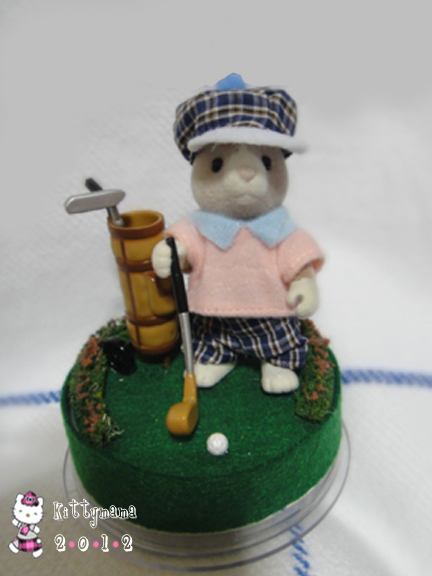 Sometimes, he even steals the scenery from my Sylvanian photo sessions, hahaha. First, I kittified my Kindle. See? It took all of 30 seconds to stick that itty bitty thing but it’s something that I keep forgetting to do. I like that my Kindle is in a pink leather case but the Kitty head somehow tied all of it together. Vavavoom- instant bling! 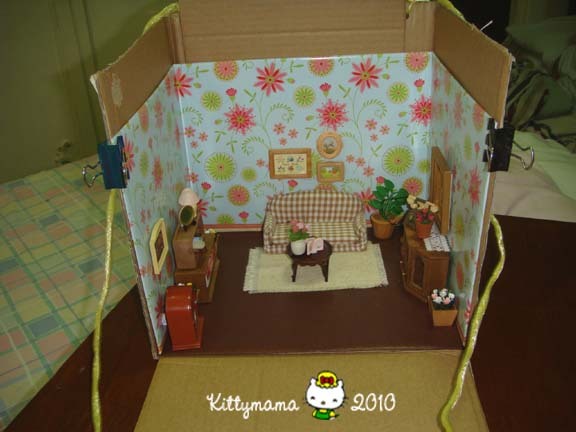 Next, I worked on photo boxes. This one took a little longer but I was actually able to finish two yesterday. 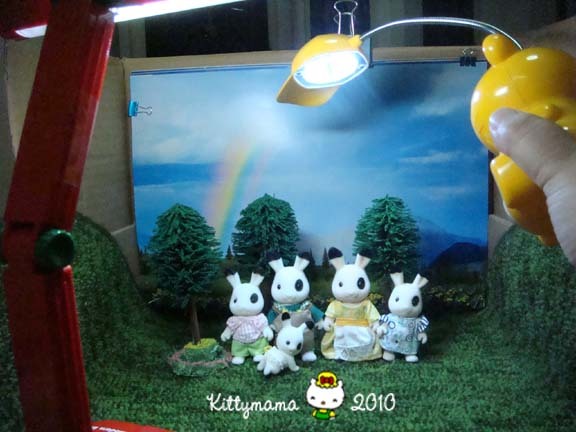 I’ve been following my forum friend Toukkero’s blog, Monta Suloista Kokoelmaa, since she started sharing her Sylvanian collections online. 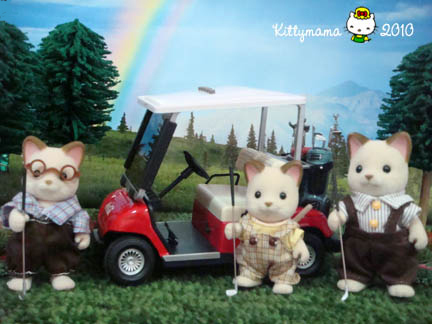 She has all these really lovely photos of Sylvanians in different rooms and settings. Her blog is in Finnish and I do need Google Translate to get the gist of her stories but I am sure you all will agree that her pictures are amazingly cute! 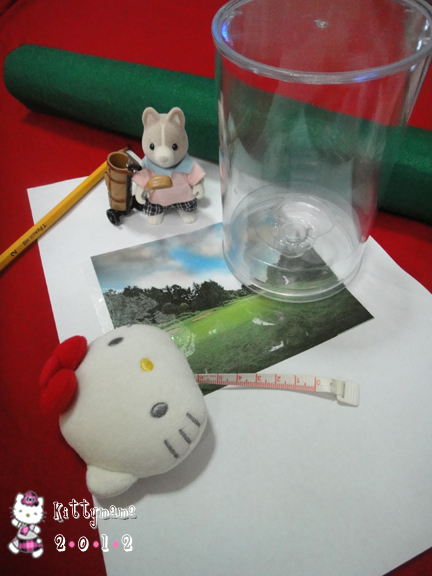 Toukkero is also very generous with her “secrets” and twice in her blog, she shifted to the English language so I can understand her instructions on photo boxes. Inspired by my friend’s creativity and generosity, I worked on my own boxes. Not only are they meant to be beautiful, they also have the added bonus of being portable. Whenever I set up my work table, it takes a while to clean up everything. When Alphonse barges in, as he inevitably does each time I work on my photography, I scramble to keep everything away before anything catches his fancy. He really loves miniature trees and so far, he has snuck out and ran off with two from my set-up. I added strings to the front and back edges of these sturdy double corrugated boxes so I can fold them up and carry them outside. The walls are made from a solid removable piece of illustration board that can be replaced with other designs as needed. I experimented with wrapping paper first but I think it’ll be better using scrapbook paper or boards in matte next time. I love the design of this one so I opted to try it out but flash photography fights with the gloss of the paper. 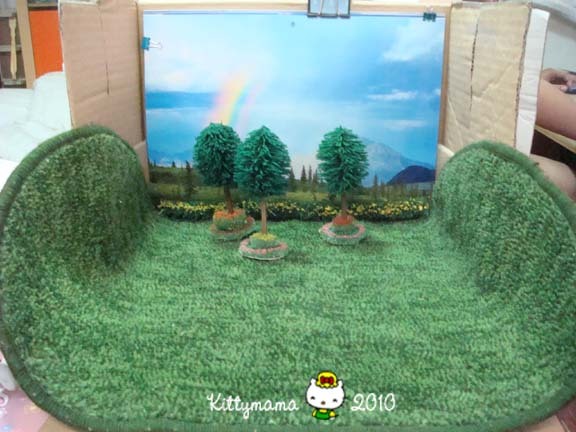 The carpet I use as grass comes from our Christmas tree set and I do have to return it soon as the Holiday season is just around the corner. That it serves another (and more important) purpose explains why I can’t cut it to box size. Instead, I stuck it down flat with some velcro stick-ons. I’m happy with the boxes for now but I’m a little disappointed with the resulting pictures. I think it’s because I haven’t worked out the kinks on lighting. I am using a battery-operated lamp from Alex’s desk and a portable rechargeable reading lamp. I will try out the different kinds of light available in the house and see what works best. As you can see, almost everything here is DIY and comes from easily accessible materials. 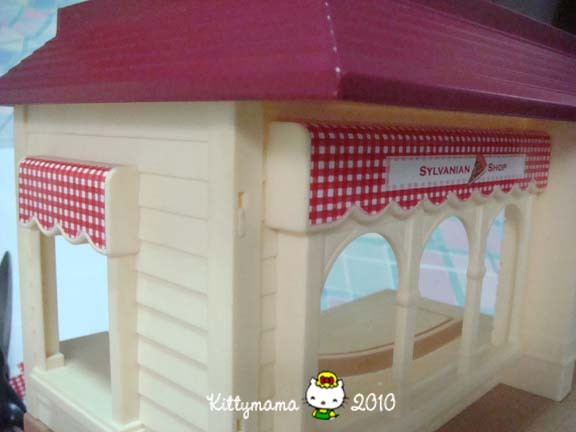 Lastly, just before bedtime, I got started on the Sylvanian pizza store I was planning to make from an incomplete bakery set I bought on sale. I used stickers to mod this, not wanting to permanently alter it and make it unrecognizable. Besides, if I do change my mind, all I do need to do is peel off the stickers and make new ones for, say, an art museum or even a bookstore, as some of my forum friends have suggested. I printed the stickers on photo paper, stuck them on, and used a cutter to cut the excess. The fluted edge of the canopies was a challenge but it just needed a steady hand and a lot of patience to get through it in one sitting. Next step would be to replace the missing counter and put the extra accessories from the pizza sets I already have. The window on the left will connect the store with the takeout pizza stalls, I will have to think through the idea of replacing the missing counter but I do have a few things in mind already. I’m amazed I was able to do all these in one day. Thank you, Alphonse, for cooperating and giving Mama some hours to do as she pleases. Thank you to my boys (my loving husband A included) who complimented my handmade creations. And most of all, thank you to the Man Up There who never fails to remind me that a day is only as productive as one wishes it to be. I am tired, but it’s a good kind of tired.